The Swiss manufacturer Addimat produces special solutions for restaurant and catering businesses. Addimat products provide professional solutions for all catering applications – from contactless identification for waiters to portioning systems and electronically controlled serving systems. Jarltech offers electronic waiter lock systems and identification technology from Addimat as official distributor. The success of the Addimat waiter self-technology is a result of many years of product development that is also based on consistent evaluation of user experiences. This trendsetting technology copes perfectly with various challenges that users have to face, giving you the opportunity to serve custom system solutions where they are required most. Not only legal reasons require proprietors of restaurants and discos to make sure that guests actually receive what they have ordered and are billed correctly. Addimat serving and identification systems give restaurateurs a better overview of servings and orders of different waiters. Our Addimat key readers are extremely compact and user-friendly. These guarantee immediate user identification that is completely reliable and easy to use. The code key clicks into the reader magnetically while it submits the stored ID. The extremely robust, water-resistant and nearly indestructible waiter key contains a unique 48-bit serial ID that cannot be manipulated. With the corresponding key types, you also can program individual character codes. Many years of experience in the field of waiter identification have given the Addimat key reader various connectivity options that allow fast and easy system integration with any cash register software. 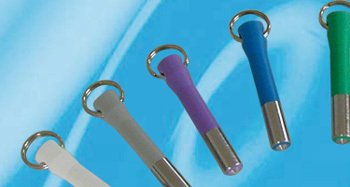 Matching the locks, Jarltech also supplies you with matching pen keys in different colours. On request, even the most unusual colour variants are available.